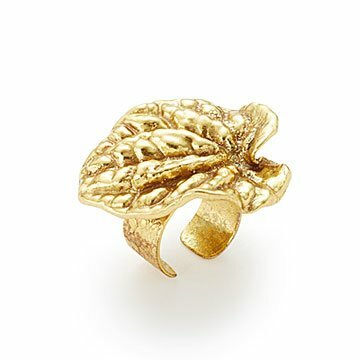 Tulianna and Alejandra Garcés created an heirloom rainforest ring by gold-plating a tropical leaf. Heart-shaped with deeply grooved veins, Peperomia leaves are living sculptures. It was only natural for mother-daughter jewelry artist team Tulianna and Alejandra Garcés to want to gild one. Native Colombians who transplanted themselves to Vermont, they were inspired by the tropical Colombian and Amazonian cloud and rainforests they're sometimes homesick for, where over 1,000 varieties of Peperomia thrive. After hand-casting a real Emerald Ripple Peperomia leaf in recycled copper and bronze, they plated it with 24k gold, and set it on an adjustable band to make a unique, conversation-starting statement ring. Also a beloved house plant, Peperomia grows two to four times larger in the wild than it does in an indoor pot. Having a gold one perched on her finger will remind every wearer of her own larger, wilder possibilities. Made in Vermont. Please keep away from creams, perfume and chemicals. If it gets wet, please air dry or wipe with a clean soft cloth. Please do not store inside plastic bags.